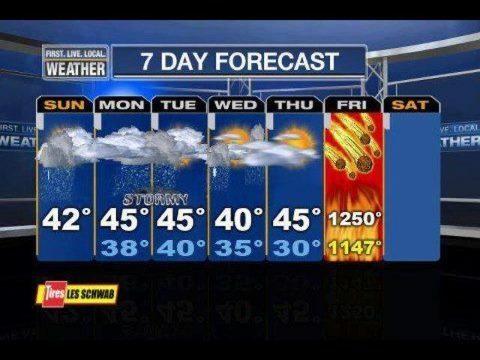 Tomorrow is the end of the world. See you at the solstice party. Betty sent the weather forecast along. We are very sad that due to the end of the world this year’s umpity-ump-zillionth frozen winter solstice party will be the last. The solstice this year is at end-date of a 5,125-year-long cycle in the Mesoamerican Long Count calendar. So tragic! Sun sets Friday the 21st at 4:52. We’ll light the bonfire shortly thereafter. It’s a sight to see, especially if it is the very last thing that you see ever. Bring your friends, warm clothing, some food to share, warm clothing, boots, warm clothing, cheesy christmas hats, warm clothing, and a bottle or two of good booze. Kids are welcome, but bundle them up. We will provide a complete bar, a keg, eating accoutrements, a HUGE bonfire, a barn with an ipod playing 500 xmas songs on random, festive lighting, horses, dogs, a peacock, and goats. Ridiculous behavior seems to be par for the course. Happy very last solstice to all. We guess that turning the sun around this year is not really that important. It’s the end of the world, and we feel fine.